I planned to go running yesterday after work. Since I’m in my taper period before the marathon, and I’m still coming off of a cold, I was planning on doing a nice gentle 4-5 miles at some extremely slow pace just to get my legs moving. I came home and felt a little sleepy, so I lay down on the bed for a little 20 minute refresher nap before heading out. Next thing I knew my phone was ringing and woke me up, it was 45 minutes later. My friend was on their way over for dinner. And I was in such a deep sleep when awoken I could barely get out of bed. No run for me. I’m feeling better today though. Still have a grogginess when I woke up this morning, and still have exhaustion. I plan on running tomorrow and for sure will get out. No excuses. Have you bailed on running plans? Do you do this often? Do you feel guilty when doing so? I do. I feel terrible like I’ve let myself down, and freak myself out like I’m going to fall behind and not be in good enough shape. Categories: Running | Tags: running, training | Permalink. One thing I think I’ve lost during this season of marathon training, is speed. I’ve gained endurance and length, but have not increased speed, and in fact I think I’ve gotten slower. After this marathon is over I need to do a “get my speed back” plan. Categories: Running | Tags: PB, personal record, PR, running, training | Permalink. One super awesome bird thing in Portland is watching the Vaux Swifts. It’s a popular activity for the entire community, regardless of any other interest in birdwatching. At the end of their Spring migration, Vaux Swifts arrive in Oregon about April or May. They nest here and their young hatch about July. Each Fall migration, they form an enormous flock and pass through Portland during their journey back to Central America. The famous stopping point during their migration is an old chimney in an elementary school in Northwest Portland, Chapman Elementary. During the month of September, each night around dusk the flock starts arriving at the chimney. It takes a good hour or more for the entire flock to arrive. They fly around, circling and circling, forming a larger and larger group. The scene is fantastic. 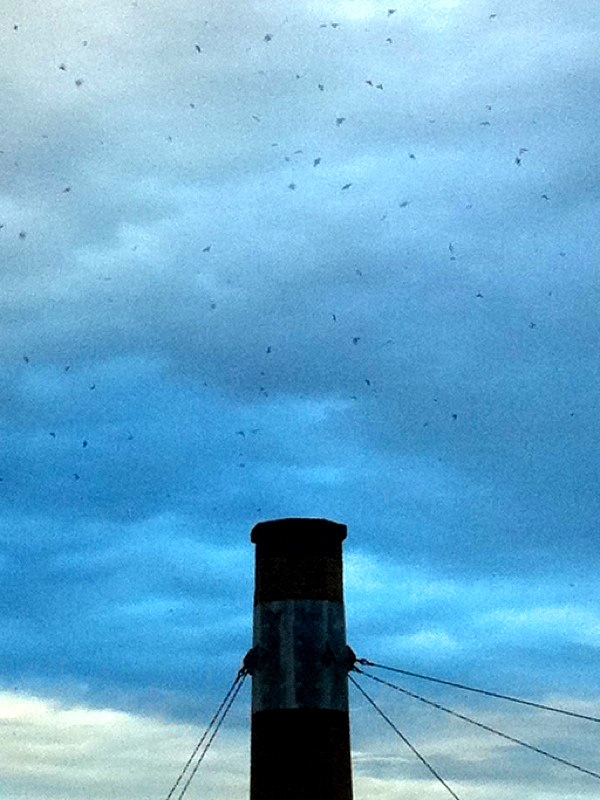 When the sun goes down, they funnel into the chimney like a live tornado to find their resting place for the night. Portlanders love this. It is a popular community activity to bring the family, the dogs, etc, bring a picnic dinner, and sit on the lawn outside the school to watch the swifts. Everyone does it. It is so common to hear people saying, “I’m going to watch the swifts tonight”. I recommend it for anyone, bird enthusiast or not. It is an incredible adventure. The local Cooper’s Hawks and Peregrine Falcons typically show up for an easy hunt. I love watching them swoop in for a meal. Sometimes a small group of swifts peel off from the larger group to chase away the predators. With a love of all birds and respecting all levels of the food chain, it’s hard to decide who to route for, the predators or the prey! Here‘s a cool YouTube I found. Seeing it in person is much preferred, but this gives you an idea how remarkable this is. Swifts usually nest in large hollow cavities such as dead tree snags. Due to declining forests these birds have needed to find other suitable places to nest. A tall chimney mimics their natural nesting sites. The Fall migration is coming to an end. The swifts will very soon pass through and not return until next year. Categories: Birds | Tags: chapman elementary, vaux swifts | Permalink. This past spring I had the wonderful opportunity to work on a project monitoring Peregrine Falcon nests in the city of Portland, through the Audubon Society of Portland. Tonight I went to a planning meeting to start planning for next season’s monitoring. Peregrines were listed on the Endangered Species list in 1973. Populations nationwide drastically decreased due to the widespread use of DDT during the 1940s through 1960s. The DDT ended up in the peregrine bloodstream, and caused them to lay eggs with thin eggshells. The eggs were unable to survive to hatching. In the 70s there were no Peregrines nesting east of the Mississippi River, and only a handful in the Western United States. Since Peregrines were put on the Endangered Species List, there have been national programs to help increase the populations. One of the efforts was programs to monitor and protect Peregrine nest sites. Monitoring nests is important. It provides data on where bird pairs are, if they try to nest, and if their nests are successful. It provides awareness of what’s going on at a site to know if intervention is needed in risky situations. If nests are successful, date tracks how many young were hatched. Young are banded and so can be tracked in the future wherever they may end up, as they establish their own territory as adults. This past year was a pretty unsuccessful season. Not many nest sites produced nests. This data is important, because while one bad year is nothing to worry about, seeing trends over time of declining or struggling populations would be noticeable. The monitoring (as well as other programs such as captive breeding programs) have led to increased populations. Peregrines were removed from the Federal Endangered Species List in 1999. They were removed from the Oregon Endangered Species List in 2007. Today there are over 150 nest sites in the State of Oregon. About 6% of the State’s Peregrine population is in Portland. Many of them nest on the many bridges crossing the Willamette and Columbia Rivers. Hearing about a success story such as this warms my heart. DDT was banned in in 1972. Despite being banned about 40 years ago, DDT still shows up in Peregrine eggshells today so can continue to be a problem. Other factors can also always be problems for potential nesters, such as industry, construction, noise, and other disruptions. Intense monitoring of nest sites in Portland continues. That is how I got involved last spring. The State of Oregon monitors annually. But the Feds are only required to monitor every three years. 2012 will be a Federal monitoring year. That is the reason for the planning meeting tonight. Next year’s monitoring will be a big deal. Peregrines are fascinating and beautiful birds. Their bold coloring is outstanding, with dark black on the face, large round eyes, bright yellow at the base of their beak and bright yellow feet. Beautiful striping on the chest and underbelly. They are fierce looking. They are the fastest animal on earth and can fly up to 200 miles per hour. Yet they are also graceful. I’ve watched them circle in flight during courtship displays. They mate for life and often return to the same nest site year after year if it was successful. I love birds. They are beautiful creatures and a pleasure to observe. But part of my passion for birds includes conservation of wildlife and the environment they require. Without conservation efforts, species might not be around for future generations to enjoy. It takes active particiation. I try to do what I can, when I can. I am looking forward to next season. Categories: Birds | Tags: birdwatching, endangered species list, peregrine falcon, wildlife conservation | Permalink. Ahh… so here we go. My first post. Topic of course needs to be the Portland Marathon. Six or eight months ago was when I first started toying with the idea of starting a blog. I was about to start training for the Portland Marathon, my very first marathon, and I knew the experience would be quite a journey. I had been posting notes on Facebook and what not, but it wasn’t giving me the outlet nor venue I was looking for. So I thought for sure I should just start a blog, and post along the way as I muddled through training for a huge goal. But somehow I never got my act together, and figuring it out just seemed like one more chore I had to do, when I was already having a hard time fitting everything in. So I never did it. Now that the Portland Marathon is less than 2 weeks away, I feel a sudden desire to write, to say all the things I might have said had I been blogging all along. So here I am. While of course there is no way I can catch up and put down all my thoughts and experiences these past months of training, I can probably summarize by mentioning just a few insightful moments during this journey. I sort of feel like starting where I am right now. Sitting at home sick with a cold/flu type illness. It is totally freaking me out. I can’t be sick! I need to run 26.2 miles 12 days from now! I need my strength! I need to keep running! I wonder if the anxiety of the approaching date has stressed me out, lowered my immune system, and that’s why I’m sick. I also wonder if I just got overworked these last few weeks. Portland has an annual “Bike Commute Challenge” city-wide, where people individually, groups, businesses, etc challenge themselves to ride their bike to work everyday for the month of September. My work group created a team and joined the event, which we have done in the past, but this year we were “challenged” by another department at my establishment. They challenged us saying that their team would ride more miles and ride more frequently than we could. So my boss, who is our Team Captain, took them up on this challenge and was encouraging everyone to ride, ride, ride so we could win, win, win. I am not much of a bicyclist. Running is really my thing. Riding my bike is really just that, riding. For fun, to commute. Not for sport, not really used for exercise. I ride slow. I have a clunky, heavy bike, a mountain bike, that is not fit for speed on the roads. People regularly pass me on the street. I don’t mind. My point is that I’m a slow bike rider, not very bike fit. Riding is a challenge for me. So as I started my bicycling to work on September 1st, it started out not so bad. But after just 3 or 4 days, it was tearing apart my quads. I know biking uses slightly different muscles in slightly different ways than running, but my quads were already overworked from running, and the difficult biking just tore them up! I could not climb stairs. I was limping as I walked. I kept riding though, I didn’t want to let my team down! I finally decided though, challenge or no challenge, I had to stop biking to save my legs for the marathon. I think I overworked myself and stressed out my body these past few weeks. So here I am, on my taper period, trying to rest and get over this illness, trying to rest up my legs. Trying to get in the low mileage to keep active. I have a massage scheduled for Friday. Looking forward to that for sure! I got sick with a cold one other time during my training. Back in June. Right about when my long runs got up to 13 miles. I was sick for two weeks. It lingered. I totally freaked out back then too. The illness set me back two weeks of training, right at the point where I felt I needed training most. I’ve run half marathons several times before, so going 13 miles was not a big deal to me. In fact, my training schedule up to that point was what I would consider easy. The weekly mileage and length of all the runs were what I’ve been used to for years. It was when the training plan got past the 13 mile mark was when I considered the program to start becoming a challenge for me, and that’s right when I got sick. The weekend long runs increased every week, to 14, then 15, and so on. So I felt like I was falling waaaaay behind by not being able to keep up. I ran a 10 miler the weekend I was supposed to do 15. And it was tough. I barely got through it. I was still not feeling well, and I did it in a very cold rain. That’s when my nightmares started. I started having bad dreams every night about running, about failing, about never being able to double my mileage from 13 to 26. The bad dreams lasted for about a month. Somehow I just got over them and they went away all by themselves. Perhaps because once I was healthy again, I was able to catch back up to my program. But the nightmares were a significant part of this process that I will never forget. It’s really what made it sink in to me that running a marathon is very much a mental challenge as much as it is a physical challenge. My psyche was being challenged, and I buckled. The mental breakthrough for me came when I first ran a 20-miler. Believe me, it was a painful 20 miles, that first 20-miler. This was also happening in August, our hottest month, in 80-90 degree weather, which is painful to me anyway even if just running 4 miles. But somehow, after I ran 20 miles for the first time, I suddenly knew that I could do it. If I could run 20 miles on an 85 degree day, for sure I could run 26 miles on a 55 degree day. I knew my body would be able to do it, and at that point my psyche believed it, and I knew I had busted through all the doubt I had in my mind up until that point. So overall I feel pretty good about myself right now (even though sick). I feel I’ve prepared decently. I’m as ready as I’m going to be. In some way I feel like it’s already over, even though it hasn’t happened yet. 12 days and counting. Looking forward to October 9. Categories: Running | Tags: marathon, portland marathon, running | Permalink.